1 What are my nameservers? 4 How do I check my nameservers? 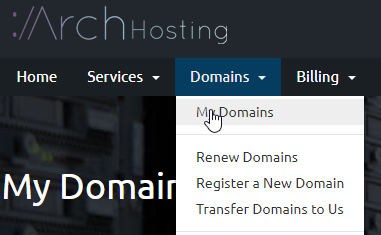 5 How do I update my nameservers for a domain registered at Arch Hosting? 6 How do I update my nameservers for a domain registered at another company? This will work regardless of the server you are on. Your domain must be updated to the correct nameservers in order for it to work with our hosting. If your domain isn't updated to the correct nameservers, your website will not load and your e-mail will not work. Nameserver changes aren't instant. Once you update your nameservers, it will take a little bit before the changes take effect on your network and your website becomes reachable. You can visit our DNS propagation wiki page to learn more about how to speed up the process. How do I check my nameservers? How do I update my nameservers for a domain registered at Arch Hosting? How do I update my nameservers for a domain registered at another company? If your domain is not registered with us, you should update your nameservers at the control panel of the company you have purchased your domain through. The exact steps vary depending on your registrar, but usually you should look for a page that has a name like "Change Nameservers", "Nameservers", "Custom DNS", etc. If you can't find it, you could try checking your domain registrar's support page or knowledgebase for a guide on how to update them. Lastly, if you still can't find it, you should contact their support team and give them our nameservers and instruct them to update the nameservers on the domain.